I love it when the weather is nice here in Portland; especially this early in the springtime. We’re so beaten down as Portlanders that we’re used to dealing with rain from November until July 5th. I think this has been one of the driest winter/springs I’ve experienced in a long time. In order to take advantage of the nice weather, Michael and I have been grilling outside. One night after work, we went for a walk to the school near our house. There were kids playing rugby, baseball, soccer, and lacrosse. We just kind of hung out for a bit enjoying the summer-like evening before heading back to the house. We had some chicken thighs defrosted but didn’t take the time to marinade them in anything. I also was out of BBQ sauce. Bummer. I think we were both craving some zingy BBQ. I found this recipe instead. It’s not a marinade but a glaze. It took two minutes to mix up and then I left Michael to do the manly grilling. Heat gas or charcoal grill. 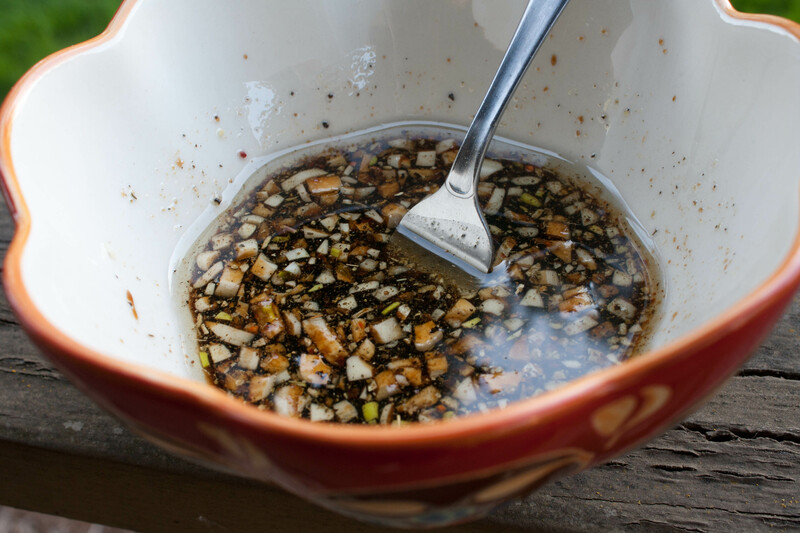 In small bowl, combine honey, soy sauce and garlic; blend well with wire whisk. Set aside. Brush chicken thighs with oil; sprinkle with salt and pepper. 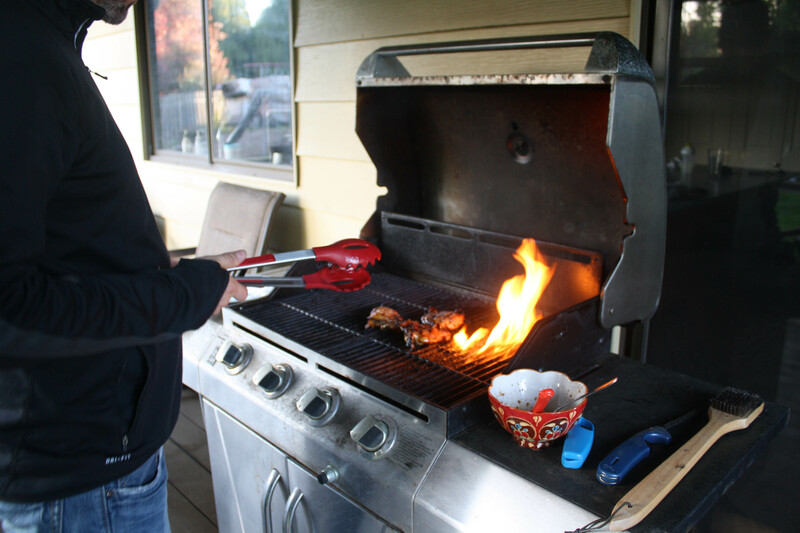 When grill is heated, place chicken on gas grill over medium heat or on charcoal grill 4 to 6 inches from medium coals. Cook covered 8 to 12 minutes or until juice is clear when center of thickest part is cut (180°F), turning once and brushing with honey mixture during last 2 minutes of cooking time. While he did that, I harvested some kale to go with dinner. Did I tell you guys I planted kale and spinach early this year? The last two years we’ve planted starters around the last weekend of April/first of May and I found that our spinach, lettuce and kale had a very short shelf life. It either bolted or was infested in aphids. Michael suggested be plant early this year because kale and spinach supposedly do better in cooler weather. One weekend in February we planted a bunch. Of course, the next day there was a week long frost! Thankfully it didn’t kill of my little greens. It was FANTASTIC. The chicken had a nice sweet, tangy flavor and some smokiness from the grill. Most of the skin burned off on the grill (too bad) but that’s alright, the chicken was not lacking in flavor. I had cooked some kale and onions in the skillet with a little coconut oil and a dash of chicken stock. I had some cottage cheese with my dinner. The evening started to get chilly so we went inside and watched Hannibal (LOVING that show) and Mad Med. QUESTION: Favorite glaze? Hannibal fan? Haha! Congrats on being recognized! I haven’t washed my hair in three days so I’d probably be mortified if someone recognized me. Oh I had a huge zit and was having a bad hair day. It was definitely not what I’d call “my shining moment.” Of course. At least I wasn’t in sweat pants…. Hi! It was awesome to see you in the building. I was *starstruck*! I know it was probably weird to be accosted by adoring fans while at work. Keep up the great bloggin’. I’ve lost 80 lbs so far and your blog always motivates me to continue on this journey. It was nice to meet you Rachel! And your friend. I was taken aback at the whole thing and didn’t know what to say. But congratulations on losing 80 pounds. That is so great. I’m glad my blog is helping you!! How fun that you were recognized. 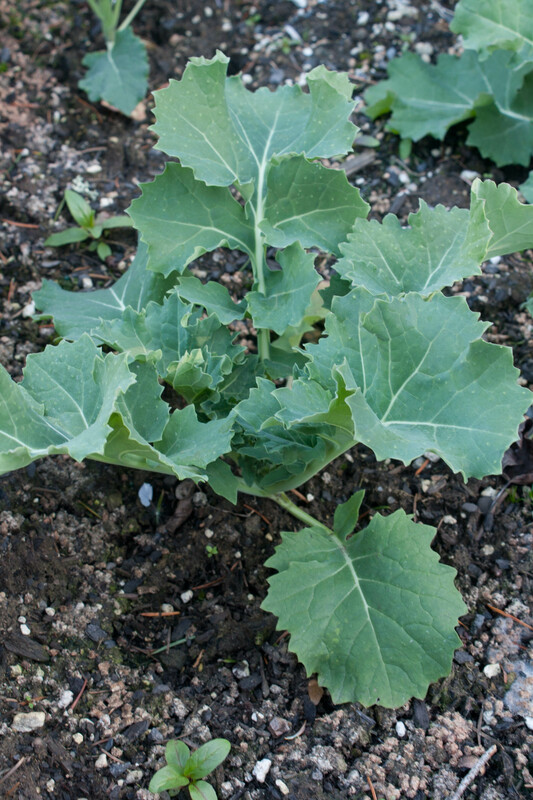 And how fun that you are growing your own kale!!! Have a great Friday Lisa. Roz@weightingfor50 recently posted..Did you wear black and white…..
Have you tried growing your own? We are FINALLY getting to some grilling-appropriate weather!! By Monday, we’ll be in the 70’s, and I can’t wait. Your glazed chicken looks fabulous. We will definitely need to try this recipe. I hope you like it if you try it. I loved it! Yum I love grilling! especially chicken, and I’m always looking for a recipe to flavor the meat without the store bought sauces that have a lot of sugar and sodium in them, this sound simple and delish!!! I much prefer to make my own marinades or glazes. I agree, the store bought stuff usually has a bunch of extra junk in it. 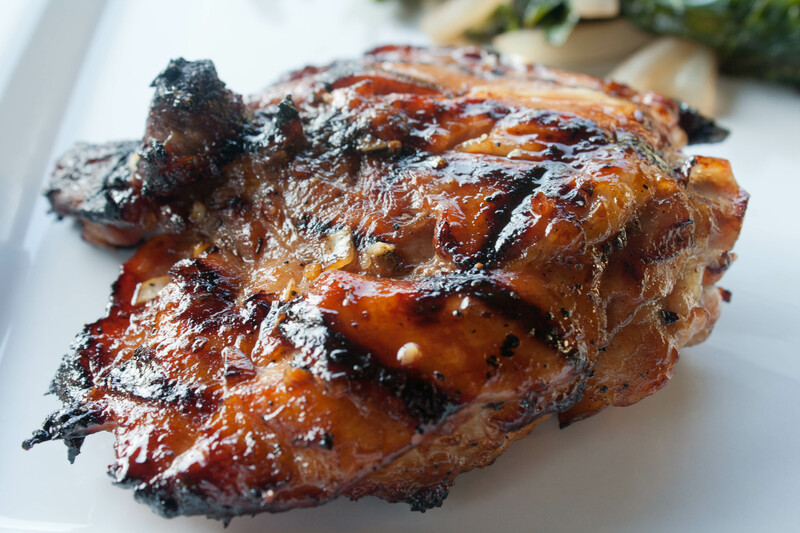 Chicken thighs are delicious! I’m all about the dark meat. Me too. It just tastes better! I’ve got to try eggshells in my garden. We don’t get slugs often unless we have a lot of rain at one time. Thanks for the tip! I love marinated meats also. For me, putting the chicken or meat in the marinade right after I bring it home works best. I then freeze the packages of meat with marinade and when I’m ready to cook them I just take them out of the freezer the night before, let them defrost overnight in the fridge and then cook them. 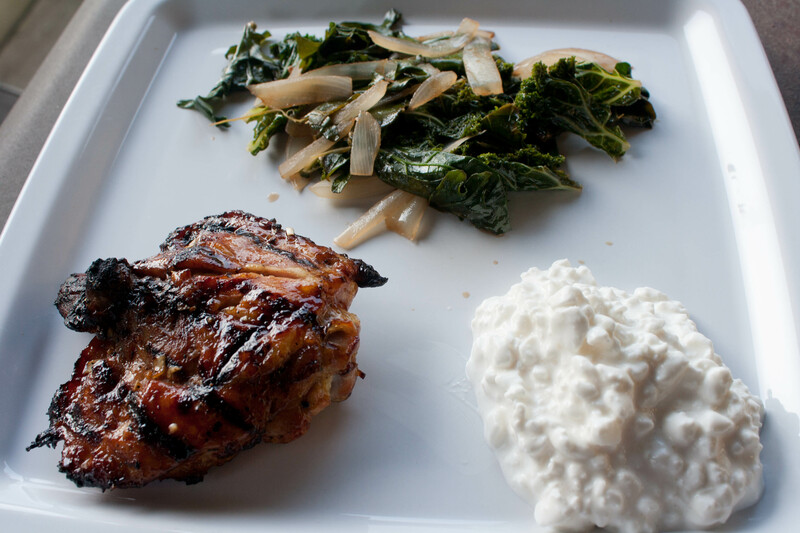 The marinade has plenty of time to soak in and make great tasting meat! What a FANTASTIC idea!! I’m totally doing this. I heard that the weather has been nice in Portland recently! You’ve got me looking forward to summer, for those grills look incredible! I honestly can’t wait, thanks for sharing, and I hope you continue to have fantastic weather, Lisa! I used a glaze very similar to this, but I think it also had some cayenne in it. I put it on grilled eggplant. Came out awesome. Kristy recently posted..Youth Weight Training: Is It Safe? That sounds really good! Love the idea of grilled eggplant. This looks amazing. I wonder if it would be much different with agave nectar? Joey recently posted..What Is The Best Exercise Equipment For Developing Your Abs? I think agave would work just as well. I often substitute honey with agave in a lot of recipes I try. That looks like a fantastic and healthy meal! This looks absolutely incredible!! I saved it to Evernote Food for another day. Hope you have a great week Lisa. Diane, fit to the finish recently posted..Can You Pinpoint the Root and Does It Matter? It was good. I hope your family likes it!